This isn't what I planned to make,..... do you get days like that. 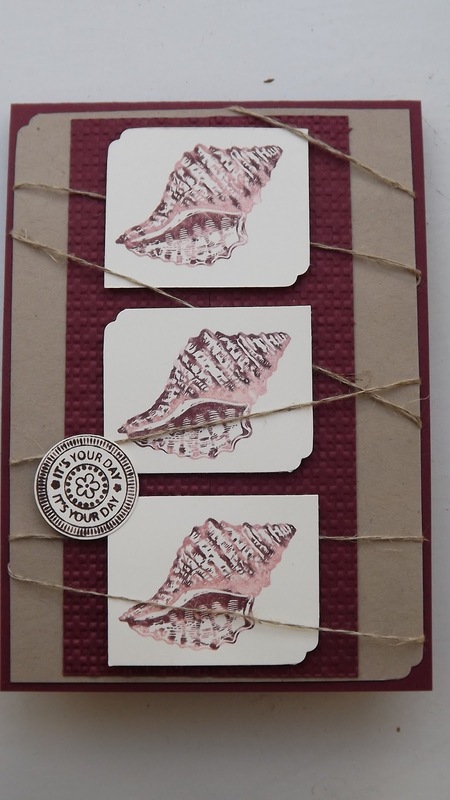 I had planned to use the lobster stamp (which I keep calling the scorpion for some reason!). But looking through my card stash I came across a packet of Regals that hadn't been opened. The sort with 2 sheets of each colour. This is the Bravo Burgandy which is disappearing. I have used the basket weave embossing folder for the background and the 'thumping technique with the ink. Ink colours are bravo burgandy and blushing bride. I do enjoy this technique and you can get some controlled effects. The linen thread just finished it off nicely. Hope you like it. Late post today as I can't get into my craft room as we have visitors so a frustrating day on the craft front but great to see my big lad and his girlfriend. This is a case from Julie Kettlewell although very different colourway. 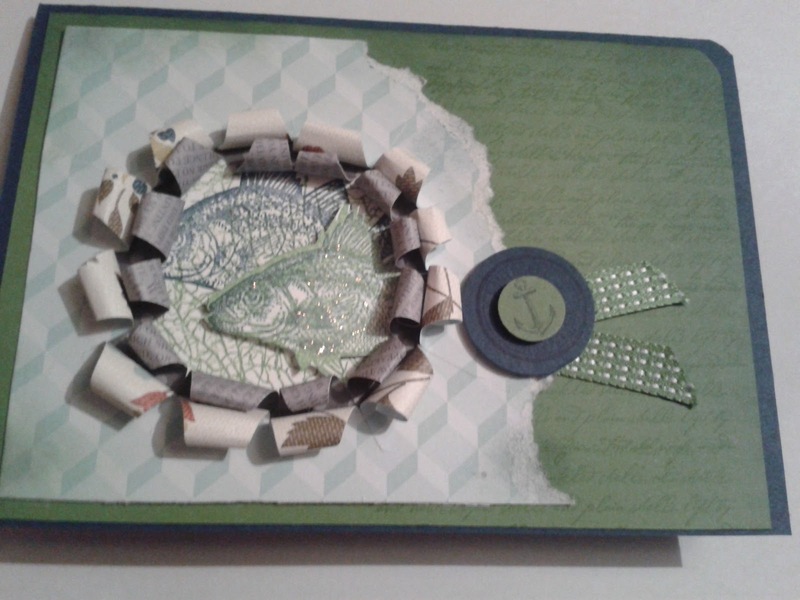 It has taken me over 2 days and is quite fiddly but I am very pleased with the result I just hope my friend is happy with it when I see her on Thursday. Another card using 'thumping' but a different colourway. 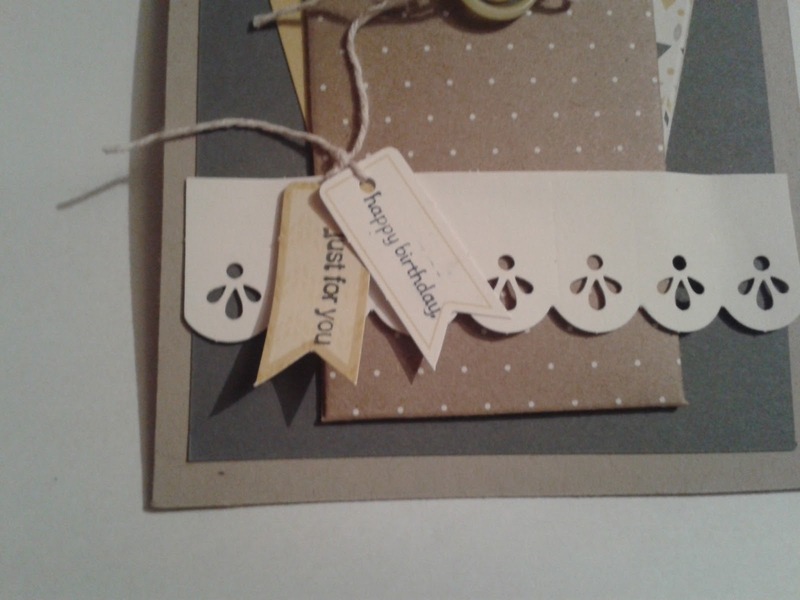 I inked the stamp with Sahara Sand first so it is much paler than yesterdays card. My thumped inks are old olive, melon mambo and tempting turquoise. The sentiment is from just believe. 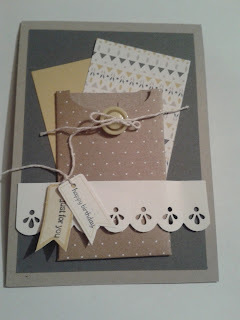 A touch of pearls and some pacific point ribbon just lift the whole card. Makes me think that spring is on its way. 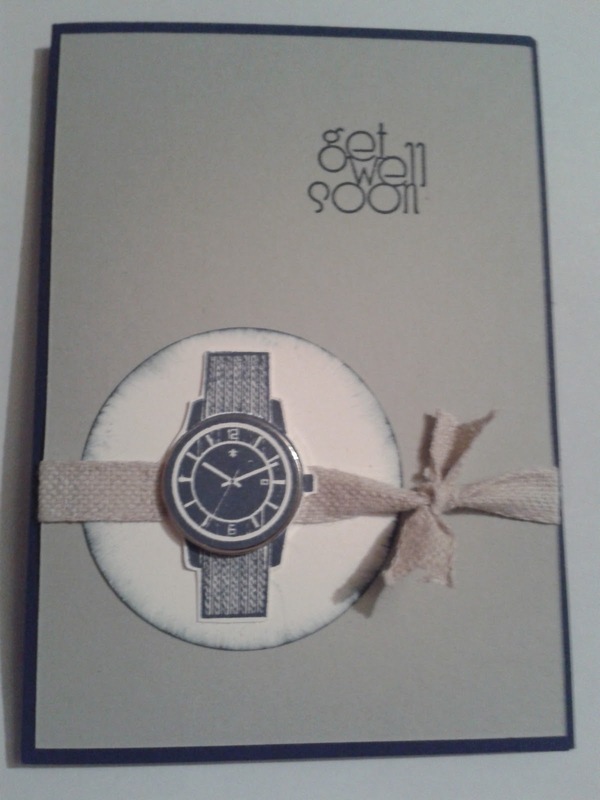 Again I couldn't use the flash because of the glossy paper so the card does look brighter than the picture suggests. I do recommend giving this technique a try. Well the butterfly is back again . I have used a new to me technique, I think its called 'thumping' Anyway you just tap the stamp with the marker to put the colour on. I used the side of the marker on the brush end after initially covering the stamp with basic grey. The inks are more mustard, elegant eggplant and cajun craze. 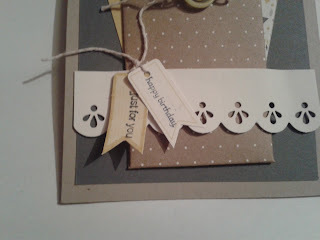 I used glossy card for this card but I think it would look just as good on the very vanilla or whisper white. I cut the butterfly out leaving a white edge and then layered onto more mustard and elegant eggplant card. The sentiment is from the Delightful Dozen set. I just love this stamp. I have used it with shrink plastic and will share the results next week. I also have plans for stamping onto material. Just need to find more time. This shows the detail and how the colours mix. The photo's were quite difficult to do because its so overcast and the flash just bounces back off the glossy paper. Thats it for today back with a totally different colourway tomorrow. The watch from the Dapper Dan set is stamped twice, the second stamped watched has its clock face punched out with the 1" circle punch. This is then mounted on to a Basic's Designer Button. This is attached to the compete stamp with dimensionals. Very effective. I have daubed the edge of a 21/2" punched circle and the watch mounted to the center of this trapping a piece of Natural 7/16" Trim Ribbon underneath that has been tied in a knot. The sentiment is from the delightful dozen. 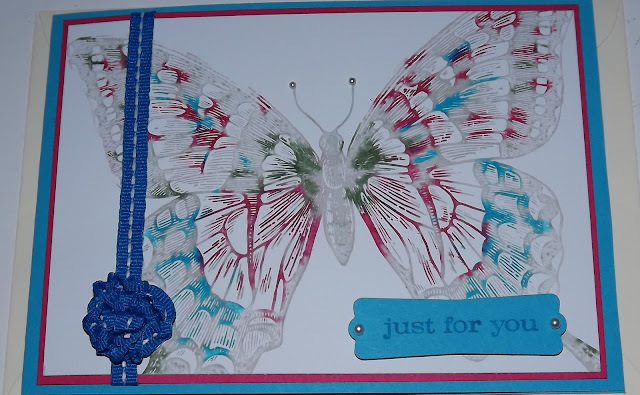 Another male themed card made during training last Saturday. 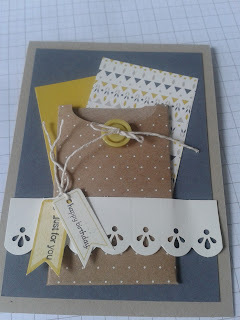 The crumb cake card has been embossed with the 'argyle' folder which I won in the raffle at the end of the day. Lucky me. 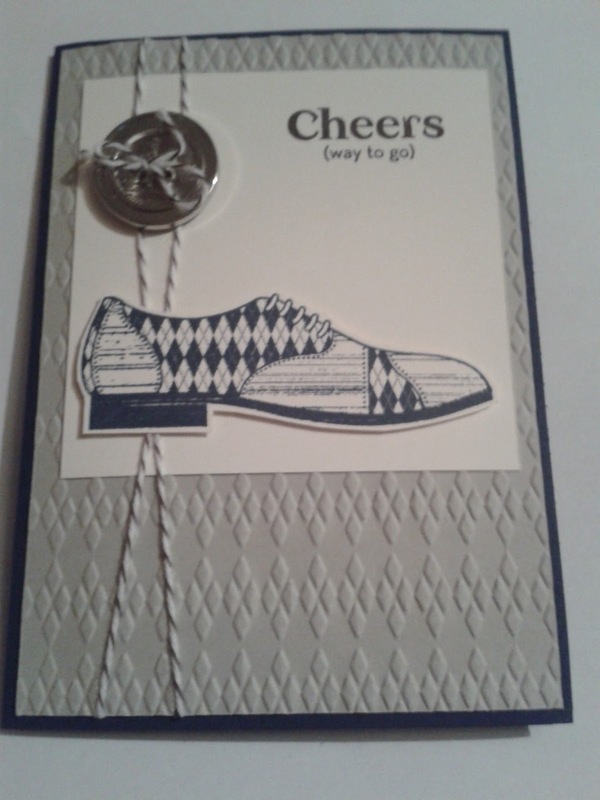 The shoe from the Dapper Dan stamp set has been stamped in Night of Navy then cut out. 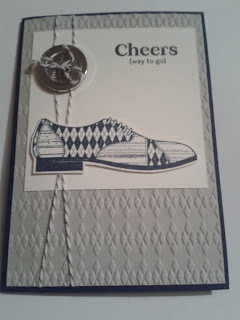 With Early Expresso twine and a Basic's Designer Button pulls the card together well. The sentiment is from 'delightful dozen'. Then all mounted on Night of navy card. 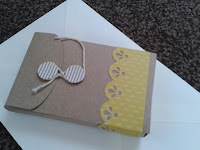 Boutique Boxes is a lovely set and so versatile. 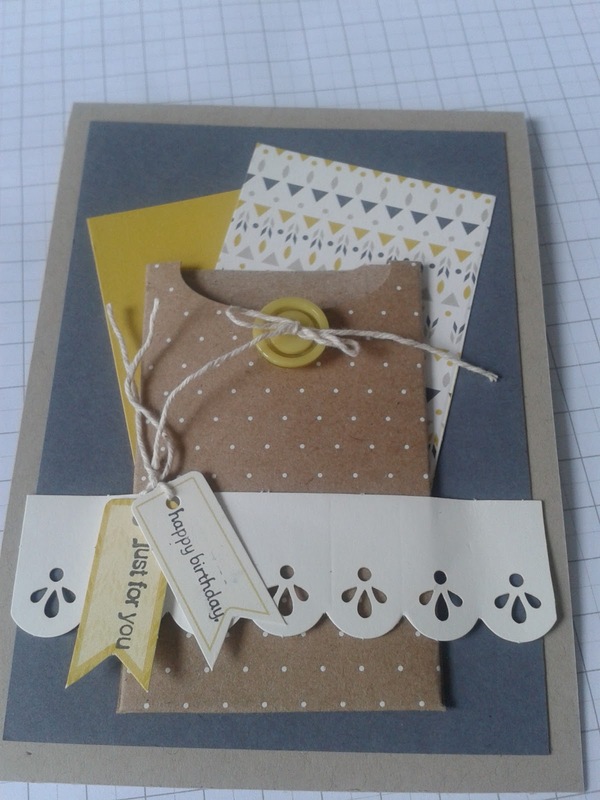 I have used elements from the set to make a card with a pocket. The pocket could be used for money or a gift voucher. 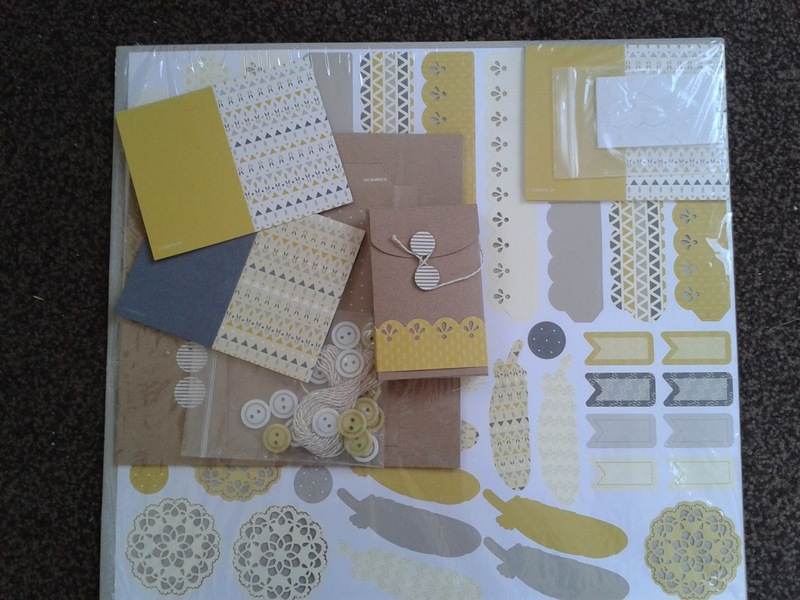 All the materials come in the pack, you just need your imagination. The pack has enough to make 8 small boxes, with a wrap, a small card that fits in each box, buttons and twine. There are push out labels, feather shaped labels and dimensionals to add these labels. Good value for money. The boxes are ideal for jewelry gifts. This is the kit. Great value for money at £7.25. 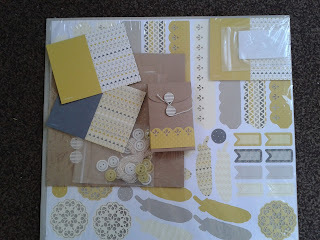 Contact me if you want more details of classes using this kit, including scrapbooking or to order. Sorry I have not blogged for 3 weeks. Back now with some great stuff to share. Firstly my swap from team training which had to be 'male' themed. 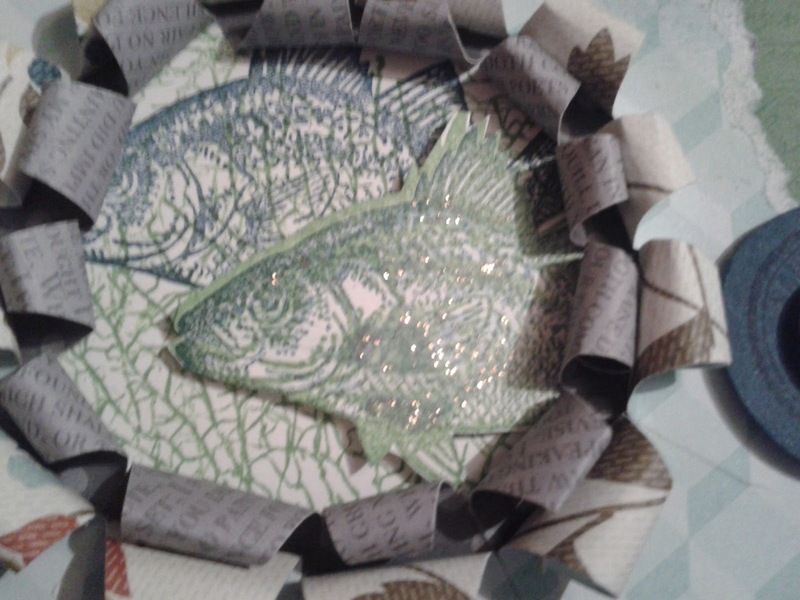 I just love the fish in this stamp set. 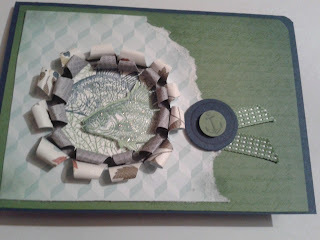 Lots of paper tearing and daubing. The paper curling took ages and when put together it reminds me of looking through a porthole at the fish. The gumball green works really well with the midnight muse.